Kobi-Wan is finding he is scoring more than his football goals since he became a member of Mosaic Clubhouse several months ago. 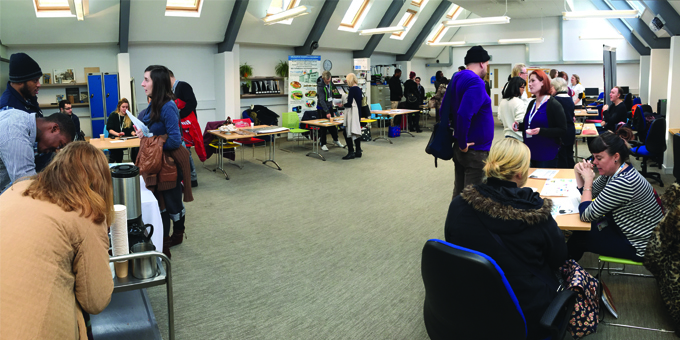 At the recent Living Well Network Open event he was snapping photographs for the Clubhouse’s ‘in the mo’ newsletter, which he has been contributing to. He particularly enjoys reporting on football.. ” I just pick a match and report on it. In the past I did voluntary work as a football coach (he qualified via a course with the Football Association). Kobi-Wan feels Mosaic has helped him turn a corner since he became unwell some four years ago. “It was recommended by my care co-ordinator. I have been working in the Business & Admin also, it gets you out of the house… I probably would have perished if I didn’t come here… I get to eat and do things. Read Kobi-Wan’s report from the match here.